First line - And out of the Darkwood Mr Toppit comes, and he comes not for you or for me, but for all of us. I was drawn to this book by it's cover. I had no idea what it was about, but I loved the cover and the title. On my cover, the blue bit has a bee in it. Little things please little minds, ay! I read the blurb on the back and I was desperate to read it. After reading the book, I am beginning to feel the cover, the title and the concept of the book were the best bits. This book starts off with a character who dies within the first chapter and becomes a bit of an enigma. Arthur Hayman who dies after being knocked down by a car, wrote a series of books called The Hayseed Chronicles. 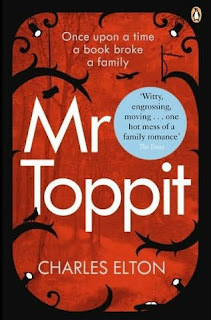 The books were about an unseen character called Mr Toppit, who lived in the Dark Woods and who seemed to control the actions of those around him. These books were written as a series for children, but never really took off until a chain of events after his death caused the books to become world famous in a Harry Potter way. I mean hugely famous! The affects the series of books have on Arthur's family become the main part of the story and you cannot help but wonder if they would have better off without the books reaching world wide fame. They really suffer because the family seem to become public property, especially Luke, who has been immortalized in the books as the main hero. The books reach worldwide fame with the help of an American hospital radio broadcaster Laurie, who by coincidence, happened to be with Arthur when he was knocked down. After mourning with the family, endlessly recounting Arthur's last words, she is given a set of books, which she takes back to America and begins to read aloud on radio. Before she knows it, the popularity of the books and her show grows and she ends up being the next Oprah! I have mixed feelings about this book, enjoying some parts and not others. I really enjoyed the beginning, even though it dealt with Arthur's death, it had humorous parts to it. The way the family take in Laurie and she grieves with these complete strangers, is satirical. Then there is Lila, the German illustrator of the book, who is hilarious. She is intent in taking care of the family during their time of grief and is appalled at how Laurie has wangled her way into the lives of the family, taking over her place. You cannot help but laugh at her actions. The passing of Arthur takes up quite a bit of the beginning of the book, the next part deals with how the books became world famous and I couldn't help but feel this was rushed. It reminded me of stories, children write where the only connective they know is 'then'. ( 'Then this happened, then they did that,then they did this, blah, blah, blah, blah!') I felt it could have been expanded to show the events in real time, rather than a running commentary. The story improved when it was decided that the books should be televised and from here the story took a darker turn. Truths that had been hidden throughout the book, come creeping out of the Dark Woods. I should warn you that the ending in not a happy one! The characters in the book are a little wishy washy. Luke who plays such a big part within the book may as well have been invisible because he had no defining characteristics or a hint of a personality. Laurie, the American, becomes rather annoying. I felt that she only got where she was due to luck, yet she actually believed she had natural talent,which was not apparent in the book. So, on the whole, the book was an average read, which I felt needed a bit of tweaking. It got off to a good start, however it fell in the middle and limped to the finishing line. On reading other reviews of this book, I found the following passage in The Observer which tells us where the idea for the book came from. I had no idea whilst reading it that it was based on A.A. Milne's son. What a fabulous concept for a story, a real shame it didn't pull it off. I would advise you to give it a go if you are stuck for something to read, just be warned about the middle part of the book and strive on until the end. I really wish I had enjoyed this more. When I saw the picture of the cover just now I went'oooooh' and then I read your review and it was 'oh'. *g* The first sentence made me think of The Book Of Lost Things by John Connolly, which I loved, but sounds like the rest of it is nothing like it. Have to admit it doesn't really apeal to me. How sad to read that bit about Christopher Robin Milne though. awww.. That thing about Christopher Robin Milne really made me sad :( I do very much like the cover of this book. I like the cover, but the book doesn't sound like I would enjoy it. Thanks for an honest review! It's too bad this didn't live up to its beautiful cover! I like the concept a lot too (especially it being based on Milne's son), so maybe I'll give it a try sometime. I hate when a book didn't live up to its concept. Doesn't seem like a book for me either, read what you had to say and, no. Your review is great, but I think I'll skip the book - I have plenty of other books I can't wait to read. I do like this cover. Sorry it wasnt that great a read. Great review, but I don't think it's my cup of tea either. Sounds really interesting! I'll keep that in mind about the middle. I tend to push through if I get half-way through a book anyways. I've got an award for you over at my blog!